Options Small 3.5" Large 7" Medium 5"
Two great toys in one, this is perfect for the dog that is both a football and tennis fan! 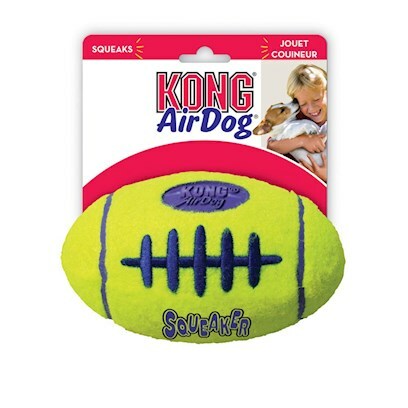 The Air Kong Squeaker Football tosses just like a football and is made from non-abrasive tennis ball material. To make it even more fun, there is a squeaker inside the ball. Give your dog fun sounding touchdown with the Air Kong Squeaker Football. Supervised use recommended. Replace if damaged. Open cover and give toy to dog.